Timi and Harold have been married for 4 years and are parents to a little boy called David. David, however is not Timi’s biological son, although she has been raising him as such. The relationship becomes rocky when David’s real mother returns to Nigeria from the US after being diagnosed with cancer. Harold’s daily visits to the hospital become a source of discord within the relationship, and Timi feeling insecure in the relationship turns elsewhere. Mercy was excellent playing the cancer patient. She really looked like she had taken a battering, like she really had gone through chemotherapy, shaved head and all. Some actresses like to add glamour when the role does not call for it (Can we say Vivky Zugah playing a lowly maid and rocking the false lashes? ), but I’m pleased to say that Mercy played her role perfectly. The most emotionally touching scenes were her crying scenes. She really showed her versatility because we all know that Mercy is able to cry buckets on the spot. The crying here was those understated, corner of the eye tears, and were even more powerful than if she had been crying buckets. Wow!!! Patrick’s (played by Eric Arubayi) teeth were three quarters gum, like a little bit of tooth was poking through a never ending mass of gum. Did anybody else notice that? Tamuno and Harold’s relationship did not end because the love died but rather because Harold loved her enough to let her to to pursue her dreams of becoming a pilot in the USA. You can see this in the way that he speaks so fondly and highly of her. The chemistry between Mercy and Desmond emanated strongly every time they were on screen together. The timeline was a bit off kilter I thought. We see that Timi has a baby with Patrick but it seemed like she had just moved in. Where did all that time go? I thought Timi referring to the child she had raised as “that boy” was a little unbelievable. This was a child that knew no other mother. So was she acting the whole time when pretending to care about the child, or were they just words of anger designed to hurt Harold? The movie started off really well but then towards the very end it started getting a bit boring as there were too many irrelevant church scenes. The church scenes were way too long and too much music and non dialogue scenes where there characters are thinking. We don’t wanna see that!!! For all those wanting to catch RMD, he isn’t actually in it much, no matter how big his face his face is on the cover. Nevertheless I would recommend it. I liked the storyline and it is worth watching just to see Mercy’s performance. Oya i need to grab a copy oh! Have seen the movie and I would say it was not bad at all. Nolly, Mercy Johnson was superb, she did her crying thing very well. Did she really shave her hair for that scene? because she played the cancer patient part real goooood! For Patrick, I agree with you, I guess he was born that way. I also got bored with some scenes in the church, I felt it went on for too long. Overall like you said, I would recommend it. Yes I think she did shave her head… It didnt look like a cap anyway! Aegoli… RMD is in the movie… He plays the pastor at the end that is persuading Desmond to take Ini back. the end is very draggy and boring, so you have probably seen all you need to see. Havent watched it yet,but i think i'll go for it.I trust mercy. very good movie. Mercy was just amazing. I can never shave my head oh!!! Acting is not easy at all!! lol!!! I didn't like Patrick's acting!!! nolly u are so funny..that Eric..i mean patrick 3/4….u knw wat got me..yeah..i actually started the movie..but it seemed a lil bit draggy…but since u watched it all..i might as well…. A bit dragggy but Mercy nails it and the chemistry between her and Desmon is fantastic. it was more of a family movie which i love. nice scripting BUT the audio was poor.and i guess it was the mistake of the sound engineer. I really wanna watch this movie online for reaL..but i dont know where to find it its so upsetting LOL! i got confused by watching "Heart of widow"(rubbish movie by the way) thinking it was the one because Mercy Johnson shove her hair on this one too,it turned one that it wasnt the one…wasted 1h 30 hours of my livee for NOTHING!! 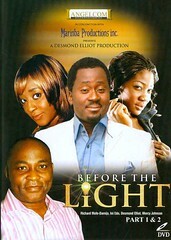 !But i bet mercy johnson knew the storyline was rubbish buh she was gnna be paid high for shaving her hair so she was thinking why NOT lol!Anyways cant wait to watch "Before the light" hoping that it is better than "Heart of a widow". Nolly, u were spot on about the pastor scene. Rather simplistic and naive I would say. But it's a reflection of what is going on in our society today-many pastors have very strong, undue influence on their members lives-they act as marriage counsellor, doctor, even give legal and business advice-eg when to buy stocks or not, child care expert, security consultant, psychologist/therapist/shrink, u name it. this is no exaggeration-its happening right under our noses. Example: If a man's prgenant wife goes into labour at home in the middle of the night, instead of the man calling a doctor or midwife, he would call his pastor first never mind that the pastor knows nothing about delivering a baby. Some pastors have replaced the roles parents, siblings, close friends and other social networks play in the lives of people. They are seen as demi-gods and can do no wrong. That is what our society has become today. So much brainwashing; most people no longer think for themselves. Their pastors do that for them. So the pastor telling d man to take his wife back-a woman who just had a baby for another man, is like art imitating life-it happens all the time here in Naija. Sad state of affairs, really. Wow thanks for your insight. It still makes no sense to me why people would treat a man like he is everything simply because fo a title, but I gues that it does happen.